At Caring Medical Regenerative Medicine Clinics, we have been seeing headache patients for a long time. In 2009, our research team lead by Ross Hauser, MD., published our findings and recommendations for the treatment of chronic headaches and migraines in patients where clear cervical neck instability was suspected. This was based on already 15 years of clinic observation. Cervicogenic headaches are simply headaches that come from the cervical spine instability. 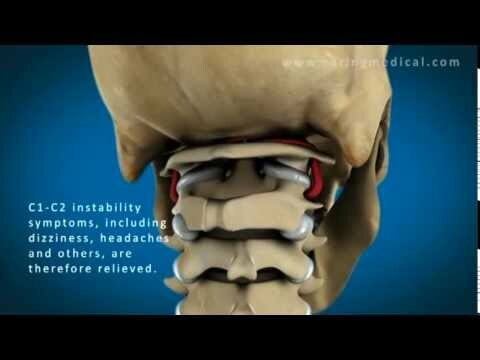 Who is someone whose cervical neck instability is causing their headaches? Someone who is constantly self-manipulating or cracking their neck. Someone who gets manipulation from chiropractors for neck pain. Someone who suffers from constant muscle spasms in the neck. Someone who had physical therapy with less than desired results. In that research published in the journal Practical Pain Management, (1) we described the problems of patients with headaches that were not being helped by traditional drug-based medicine and stress management. Not much has changed in the last ten years. “While medicine carries 150 diagnostic headache categories, the vast majority of recurring headaches are classified as either migraine or tension. The most common headache types among adults and adolescents are tension headaches, chronic daily headaches or chronic non-progressive headaches. These muscle contraction headaches cause mild to moderate pain and come and go over a prolonged period of time. Migraine headache pain is often moderate to severe and described as a pounding, throbbing pain lasting from four hours to three days, and usually occur one to four times per month. Migraines are associated with symptoms such as light sensitivity, noise or odor sensitivity, nausea or vomiting, loss of appetite and stomach upset or abdominal pain. Typical medical treatments for tension or migraine headaches involve the use of medications such as nonsteroidal anti-inflammatory drugs (NSAIDs), triptans or muscle relaxants. Despite the advances in migraine-specific drugs, only 50% of patients with migraine headaches attain more than 50% reduction of headache frequency after three months of treatment. Among some of the reasons that patients do not get headache or migraine relief is that pharmaceutical-based management of the patient’s headaches does not address the problem of headaches coming from neck pain caused by weakened or damaged cervical ligaments. In our 2014 research lead by Danielle R. Steilen-Matias, MMS, PA-C and published in The Open Orthopaedics Journal (2) our research team was able to demonstrate that when the neck ligaments are injured, they become elongated and loose, which causes excessive movement of the cervical vertebrae. In the upper cervical spine (C0-C2), this can cause a number of other symptoms including, but not limited to, nerve irritation and vertebrobasilar insufficiency with associated vertigo, tinnitus, dizziness, facial pain, arm pain, and migraine headaches. A brief note on vertebrobasilar insufficiency. Typically this describes a narrowing of the arteries that is usually treated with blood thinners and cholesterol medication. In this context, vertebrobasilar insufficiency is describing a situation where hypermobility of the neck vertebrae is causing a “squeezing,” of the arteries by pinching movement. We are going to explore research which will give evidence that your chronic headache and migraine is not being resolved because no one is talking to you about ligaments, perhaps except those health care providers who cannot offer injection treatment or cannot prescribe pharmaceutical management: chiropractors. We will also discuss physical therapy below. An October 2018 study published in the journal BioMed Central Neurology, (3) describes the challenges faced by patients and chiropractics in helping the patients with a tension headache, migraine, and cervicogenic headache. Here are the learning points from that research. The use of chiropractors for headache management appears to be significant. In a recent national US study, manipulative-based physical therapies were reported to be the most frequently used complementary and alternative treatments for migraine and headache patients. In North America, a general population study reported between 25.7–36.2% of migraine headache patients had sought help from chiropractors at some time. While the use of chiropractors for the management of headache disorders appears to be significant, little is understood about how this provider group manages this substantial patient population. between 14.9–16.5% reported providing more than 10 visits across all 3 headache types. How do chiropractors treat by headache type? and non-thrust spinal mobilization (88.4%). and soft tissue therapies (massage, myofascial, stretching or trigger point therapy) to the neck/shoulder area (88.1%). Chiropractors understand that there is a neck component to headache management, they may not have all the tools they need in their treatments to offer satisfactory relief for some patients. If you are reading this article you are likely one of these patients. Let’s look at five recent research studies. Researchers representing Lund University in Sweden and the University of Copenhagen in Denmark published a December 2017 study in The Journal of Headache and Pain (4) showing that the prevalence of migraines with co-existing tension-type headache and neck pain is high in the general population. They also acknowledge the problem that there is very little literature on the characteristics of these combined conditions. which among the three conditions (migraine, tension-type headache or neck pain) is rated as the most burdensome condition. 100 (67%) suffered from co-existing tension-type headache and neck pain. Only 11% suffered from migraine only. (Only 1 in 9 migraines did not have a neck component). Persons with migraine and co-existing tension-type headache and neck pain had lower level of physical activity and psychological well-being, higher level of perceived stress and poorer self-rated health compared to healthy controls. They reported reduced ability to perform physical activity owing to migraine (high degree), tension-type headache (moderate degree) and neck pain (low degree). The most burdensome condition was migraine, followed by tension-type headache and neck pain. The researchers were able to conclude that migraine with co-existing tension-type headache and neck pain was highly prevalent and that persons with migraine and co-existing tension-type headache and neck pain may require more individually tailored interventions to increase the level of physical activity, and to improve psychological well-being, perceived stress, and self-rated health. Now let’s examine the second study from a diverse team of Canadian researchers from medical universities and hospitals throughout Canada. Here doctors writing in the European Spine Journal explored treatments for managing patients who suffered from chronic tension-type headaches with constant neck pain and muscle spasm. The muscle spasms should have been a clue that the headaches were being caused by cervical neck instability. Muscles spasm in unstable joints because they are being overworked trying to help or replace the function of damaged ligaments and tendons in stabilizing the joint. This is shown by researchers at the Canadian Memorial Chiropractic College who wrote of the effectiveness or non-effectiveness of non-invasive and non-pharmacological interventions for the management of patients with headaches associated with neck pain. In the European Spine Journal (5) they suggested that treatments should include exercise (to help stabilize), relaxation training with stress coping therapy (to reduce spasm) and perhaps manual therapy (chiropractic) to help get the neck back in its natural position. Quick summary: The research found that headache had a neck instability component and the treatments offered were symptom management techniques, not curative techniques. Again, the researchers point to system suppression, at least in these papers attempts are made to get away from pharmaceutical management of chronic headaches and do seek to find the problems of headaches routed in neck pain and instability and muscle spasm. Quick summary: Why increase pain threshold? Why not get rid of headache pain? Lastly, the fifth paper doctors examined the 4th phase of a migraine cycle – The migraine postdrome – that is the physical aftermath after the migraine episode has dissipated. In this study of 120 patients, 81% reported at least one non-headache symptom in the postdrome. There is a striking underestimation of the frequency of neck stiffness and sensitivity to light and noise. Do weakened ligaments in the neck cause an unnatural head posture which can cause headaches? Can strengthening these neck ligaments resolve the problem of chronic headaches and migraines by resolving the problem of cervical instability? Prolotherapy is based on the theory that the cause of most chronic musculoskeletal pain is ligament and/or tendon weakness (or laxity). This retrospective pilot study was undertaken to evaluate the effectiveness of dextrose prolotherapy on tension and migraine headache pain and its associated symptoms. Typical areas treated during Prolotherapy sessions for chronic headaches and neck pain are the base of the skull, cervical vertebral ligaments, posterior-lateral clavicle, where the trapezius muscle attaches, as well as the attachments of the levator scapulae muscles. Because there is an anesthetic in the solution, generally the neck or headache pain is immediately relieved. This again, confirms the diagnosis both for the patient and the physician. Prolotherapy, by strengthening cervical ligaments and tendons, treats very common trigger and pain locations of the posterior neck that can cause headaches. Prolotherapy will likely become an increasingly useful treatment for aging patients who experience an increase in cervical pain as a trigger for tension and migraine headache pain. Of the 15 patients, five reported daily tension or migraine headaches. Another five participants experienced three to six tension or migraine headaches per week. Taken together, 66% of study participants had tension or migraine headaches multiple times each week. Only one patient continued to have daily headaches, although all respondents reported a decrease in the level of pain overall. Patients were asked to rate the intensity level of their headaches prior to receiving Prolotherapy and after their last prolotherapy treatment, using a scale of 1 to 10 (1 being non-noticeable and 10 being severe). Prior to treatment, 67% reported a pain level of 10 out of 10. The remaining 33% of study participants rated their pain between 8 and 9 out of 10. All of the participants reported that their pain was at least 8 out of 10 on the pain scale prior to Prolotherapy treatment. Following treatment, significant decreases in intensity level were noted for 100% of the patients. Forty-seven percent were able to state that the intensity level following treatment was at level 1. Prolotherapy treatments, rating them on a scale of 1 to 10 (with 10 being the most severe). Sixty-seven percent reported a 10 out of 10 light sensitivity prior to treatment. After Prolotherapy, 67% reported sensitivity levels of 1, indicating very little sensitivity to light during a headache. Our study followed patients, on average, 22 months after their last Prolotherapy treatment and all 100% still had benefit. number of associated symptoms and light sensitivity in patients with tension and migraine headache pain.